On the Manage Account > Students screen, you can control the current activities that children are playing by changing their assignment. Please be careful to when setting a new assignment as there is no way to undo that once it has occurred. Changing the birth date on this screen does not automatically reset the assignment and so if you accidentally marked the birth date incorrectly during sign up, modifying it here will not be disruptive to your student’s experience. 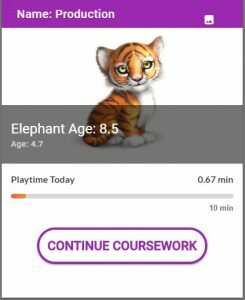 You may also add and remove students from this screen and control the daily playtime for each student. The daily playtime field controls both the amount of time a student may play during the day and also the graph on the dashboard that is underneath the avatar. If unlimited playtime is turned on, then there will be no daily playtime limit. 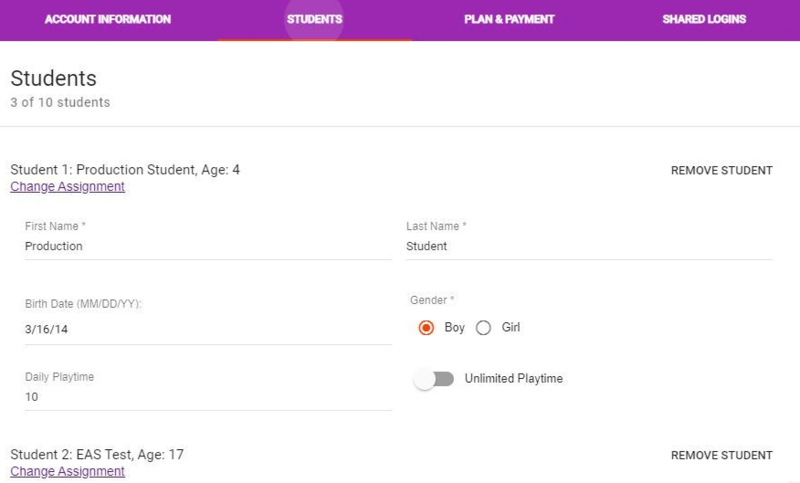 The Daily Playtime field will not limit the student’s playtime but will still control the graph underneath the avatar to provide a guideline to the daily playtime to your student.